Mode conditioning patch cords are required where Gigabit 1000 Base-LX routers and switches are installed into existing multimode cable plants. These specialized cords help avoid Differential Mode Delay (DMD) effects that can occur when long wave transceiver modules operate at both single-mode and multimode wavelengths. The mode conditioning patch cord causes the single-mode transceiver to create a launch similar to a typical multimode launch. Our mode conditioning patch cords are custom made with any combination of LC, SC, ST, FC or MTRJ connectors at each end. A 9/125-singlemode fiber is offset to a multimode fiber on one leg while the other leg consists of a standard multimode fiber. The single mode/multimode side is plugged directly into the equipment. 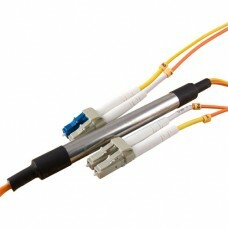 The duplex multimode side of the patch cord is plugged into the cable plant side. Our mode conditioning patch cords are compatible with 850nm or 1300nm Gigabit Ethernet on standard multimode fiber, and a VCSEL laser source into standard multimode fiber. They are built to the IEEE802.3z application standard. 1) Mode conditioning cable are normally used in pairs. That means that you will need a Mode Conditioning cable at each end to connect the equipment to the cable plant. So then these cables are usually ordered in even numbers. The usual reason why someone may order one cable is so they may keep it as a spare.